Giuseppe Cesari (February 1568 – 3 July 1640) was an Italian Mannerist painter, also named Il Giuseppino and called Cavaliere d'Arpino, because he was created Cavaliere di Cristo by his patron Pope Clement VIII. 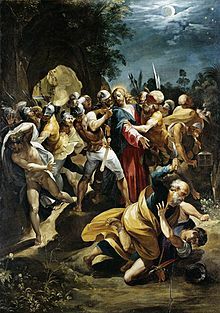 He was much patronized in Rome by both Clement and Sixtus V. He was the chief of the studio in which Caravaggio trained upon the younger painter's arrival in Rome. Cesari's father, Muzio Cesari, had been a native of Arpino, but Giuseppe himself was born in Rome. Here, he was apprenticed to Niccolò Pomarancio. Cesari is stigmatized by Lanzi, as not less the corrupter of taste in painting than Marino was in poetry. (Lanzi disdained the style of post-Michelangelo Mannerism as a time of decline). Cesari's first major work done in his twenties was the painting of the right counterfacade of San Lorenzo in Damaso, completed from 1588 to 1589. On 28 June 1589, he receives the commission for the murals of the choir vault in the Certosa di San Martino in Naples. From 1591 he is again in Rome, where he painted the vault in the Contarelli Chapel within the church of San Luigi dei Francesi. He also completed murals in the Cappella Olgiati in Santa Prassede, and the vault of the Sacristy in the Certosa di San Martino. He was a man of touchy and irascible character, and rose from penury to the height of opulence. His brother Bernardino Cesari assisted in many of his works. Cesari became a member of the Accademia di San Luca in 1585. In 1607, he was briefly jailed by the new papal administration. He died in 1640, at the age of seventy-two, or perhaps of eighty, at Rome. His only direct followers were his sons Muzio (1619–1676) and Bernardino (d. 1703). Pier Francesco Mola (1612–66) apprenticed in his studio. Other pupils include Francesco Allegrini da Gubbio, Guido Ubaldo Abatini, Vincenzo Manenti, and Bernardino Parasole. His most notable and perhaps surprising pupil was Caravaggio. In c. 1593-94, Caravaggio held a job at Cesari's studio as a painter of flowers and fruit. ^ a b Langdon, Helen (2000). Caravaggio: A Life. Westview Press. ISBN 9780813337944. ^ Röttgen, Herwarth (1964). "Giuseppe Cesari, die Contarelli-Kapelle und Caravaggio". Zeitschrift für Kunstgeschichte (in German). 27 (3/4): 201–227. JSTOR 1481646. ^ Hobbes, James R. (1849). Picture collector's manual; Dictionary of Painters. T. & W. Boone, 29 Bond Street, London; Digitized by Googlebooks (2006) from Oxford library. p. 49. Hobbes, James R. (1849). Picture collector's manual; Dictionary of Painters. T. & W. Boone, 29 Bond Street, London; Digitized by Googlebooks (2006) from Oxford library. p. 49. Chisholm, Hugh, ed. (1911). "Cesari, Giuseppe" . Encyclopædia Britannica (11th ed.). Cambridge University Press. Wikimedia Commons has media related to Giuseppe Cesari.